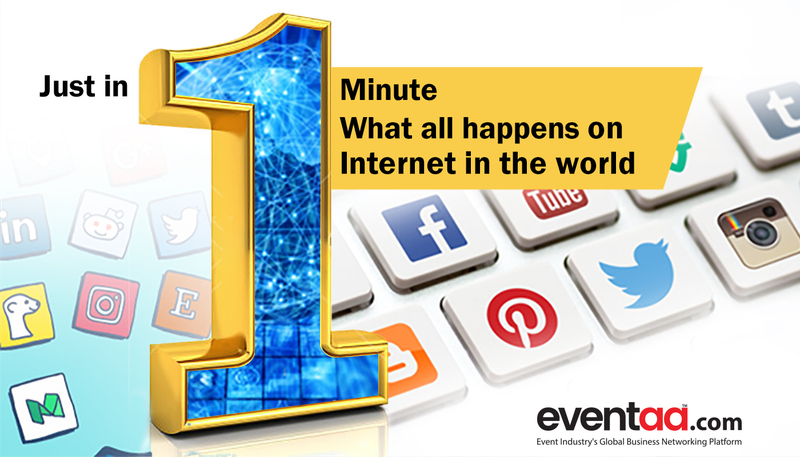 Blogs eventaa- In just 1 minute do you know the usage of Internet? Home Blogs & Article Hindi In just 1 minute do you know the usage of Internet? In just 1 minute do you know the usage of Internet? From a total of 8 billion people around the world, there are nearly 4 billion active users on the internet and 2 billion on Facebook alone. These insights tell the widespread prevalence of the internet and its influence globally. Forget about the hours, even if you trace internet user’s interaction on the internet for a minute, the stats will blow your mind. See table below the number of users using various social media and online platform in one minute. The observation implies that internet has put people’s lives at comfy, one single click and everything is at your disposal. This single click actually triggers multiple actions on social media as well as the online platform. The fold of social-platform engagement has increased twice or thrice in the last couple of years with the inclusion of a number of mobile users. For instance, you decide to buy a pair of shoes from an e-commerce site, but before buying you are advised to follow the imbibed customs or rules that every online user follows. Buying one pair of shoes now involves many action points. These series of actions tell us how the internet or social media influenced our lives. This simple example deals with just one part of e-commerce. But around the globe, millions of people engage in various ways such as, checking hotels, booking event venue, hospital availability is changing the game of commercialized market. Surprised? Someday your home-address will be replaced by some weird looking digital address. But the question here is unlimited traffic, tweets, data-packs; does it all add meaning to your particular search? This is where expert content and social media influencers steps in. They are the ones; customers look forward to, before taking any decision. They drive consumers to buy product or service on the internet. Since the internet is an open source, anyone can pitch their voices, and disguise genuine users, but the influencers are the ones who act as custodial through their “word of mouth” and “subject matter knowledge”. The present-day scenario is quite lucrative for online business dwellers; the only thing that matters is right timing and the perfect strategy. Even the analytic reports favor the “Digital Age” and its augmentation. The penetration of Internet, mobile and social media users on an average are between 40-60 %, these results do not even confide half the total population of the world (8 billion). There is enough space for online business enthusiasts to embark their business. Editor's Note: This post was originally published on 31 August 2017 in World Economic Forum and has been updated here for knowledge, awareness, and comprehensiveness.